It was the first time in three years the Uruguayan has been able to start a season following biting bans in the past two years. But Luis Enrique, who has lost Pedro and Xavi from his squad this summer, will be worried about injuries to right-back Alves and midfielder Busquets. The game will be seen as revenge for Barcelona, who lost 5-1 to Athletic Bilbao over two legs in the Spanish Super Cup in the past two weeks. Real Madrid played Sporting Gijon immediately afterwards, and drew their match 0-0. Atletico Madrid beat Las Palmas 1-0 on Saturday, with Antoine Griezmann scoring the only goal. Match ends, Athletic Club 0, Barcelona 1. 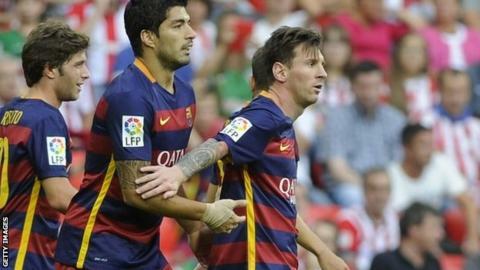 Second Half ends, Athletic Club 0, Barcelona 1. Offside, Barcelona. Javier Mascherano tries a through ball, but Sergi Roberto is caught offside. Attempt saved. Aymeric Laporte (Athletic Club) left footed shot from outside the box is saved in the centre of the goal. Assisted by Elustondo. Foul by Elustondo (Athletic Club). Attempt saved. Lionel Messi (Barcelona) left footed shot from the centre of the box is saved in the centre of the goal. Assisted by Ivan Rakitic. Substitution, Barcelona. Sandro Ramírez replaces Rafinha. Attempt missed. Ibai Gómez (Athletic Club) right footed shot from the centre of the box is high and wide to the right. Assisted by Eraso with a headed pass. Attempt missed. Markel Susaeta (Athletic Club) right footed shot from outside the box is high and wide to the left. Assisted by Eraso. Gurpegi (Athletic Club) wins a free kick in the defensive half. Eraso (Athletic Club) wins a free kick in the defensive half. Offside, Athletic Club. Aymeric Laporte tries a through ball, but Eraso is caught offside. Ibai Gómez (Athletic Club) is shown the yellow card for a bad foul. Substitution, Barcelona. Marc Bartra replaces Sergio Busquets because of an injury. Thomas Vermaelen (Barcelona) is shown the yellow card for a bad foul. Substitution, Athletic Club. Ibai Gómez replaces Sabin. Substitution, Athletic Club. Gurpegi replaces Mikel Rico. Offside, Athletic Club. Gorka Iraizoz tries a through ball, but Eraso is caught offside. Sergi Roberto (Barcelona) hits the bar with a right footed shot from the right side of the box. Assisted by Rafinha. Corner, Barcelona. Conceded by Mikel Rico.